Going into this book I had read that Season of the Harvest, by Michael R. Hicks, has been compared to Michael Crichton and I was skeptical of that statement, because Crichton was a favorite of mine. It turns out that it's a pretty accurate description. This book is an intense, edge of your seat, sci-fi thriller that sets out to prove that you really are what you eat, unfortunately! The book follows Jack Dawson, (yes, I immediately thought of Rose's lost love in the movie “Titanic” when I read the name too) an FBI agent, as he learns to deal with his own personal tragedies while the rest of the world unravels beneath his feet. Dawson is almost immediately dropped down the “rabbit hole” into a reality he never knew existed. He is quickly indoctrinated into the world of eco-terrorists, Harvesters, genetically modified food sources, and a plan that could obliterate the planet's life forms. Once the truth is out the clock begins ticking down as Dawson and a slew of other characters race to save the world. I could not put this book down once I picked it up. In fact, knowing I was doing the review, I went back to take notes and found myself re-reading it. At 150,000 words (nearly 400 pages if you're reading the paperback) this book is not a quick read, but you fail to notice the length as the fast pace takes you from scene to scene without missing a beat. I give the author kudos for the amount of research he had to undertake in order to make this book believable. 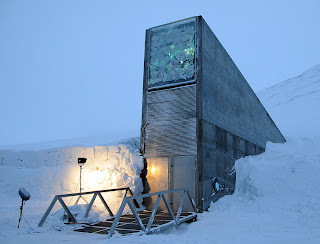 I found myself Googling things I had never even thought of before like the Svalbard Global Seed Vault and online auctions for defunct Titan missile silos. I feel as though I am coming away from this book not only thoroughly entertained, but with a higher I.Q. Okay, maybe not a higher IQ, but definitely some really cool tidbits of knowledge. As if being so engrossed in the book wasn't sign enough of the author's talent, after Googling Svalbard I realized how good Hicks truly is. The image I found of the seed repository there was exactly as I had pictured it thanks to the book's description. Hicks certainly earned his five star review on Amazon.com from me. 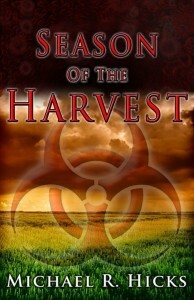 Season of the Harvest was smart, entertaining, and believable. If you enjoy your Sci-fi novels and/or thrillers check this book out and then hang on to the edge of your seat, because that is where you will be perched until you hit the last page! Michael R. Hicks is also the author of the Sci-Fi/Fantasy series In Her Name.